We dived right in expecting the usual Kettle Chips solid crunch, but while these Crisps seemed a little more muted. They were still thick and munchy, but for some reason there was not the usual crisp, crack and shatter. It may have been the plentiful powder having soaked up the oil, but as I say, just a bit surprising. As with all Kettle Chips, these Crisps were thick enough to appear solid; no transparent oil patches. There were a fair few oil blisters, but perhaps not as many as feature most regularly on Kettle Chips offerings. There was a healthy (depending on how you look at it), coating of orange coloured powder. A Nose Plunge Test revealed that pleasant aroma when the dishes are rolled out on the trolley to your table in a Chinese Restaurant. There was a lot going on with this flavour to pick out individual flavours. For example, we could not pick out the Honey. 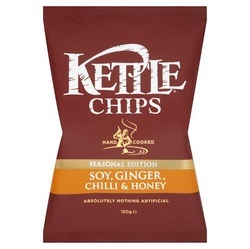 Neither could we pick out the Chilli, but we are going to give them the benefit of doubt here and say the Soy, Ginger and Chilli especially, blended well enough together to provide that familiar spicy Oriental flavouring we were hoping for.